The network backbone contains a wealth of information that can be monitored and collected to support diagnostic, troubleshooting, and fraud prevention activities. Surveillance of network characteristics is becoming more important than ever before. Few important aspects of network surveillance include, Performance Monitoring, Security, Fraud Prevention, Physical Layer monitoring, Billing Verification, Remote Protocol Analysis, Failure Prediction, Traffic Engineering, Call Quality Monitoring and Troubleshooting. GL’s Passive Network Monitoring and Diagnostic Systems support operators, and service providers to perform all the above functions. 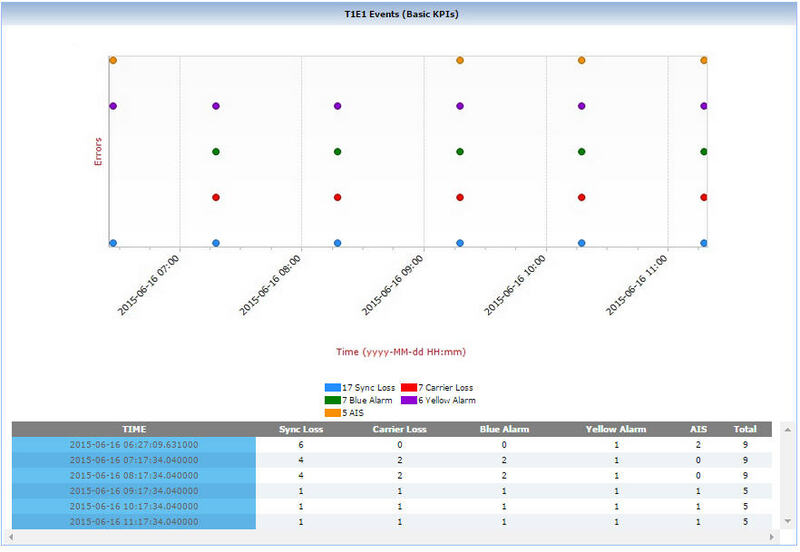 The network monitoring systems facilitate real-time analysis, historical storage, retrieval, querying, and display of Call Detail Records (CDRs) by non-intrusively connecting to TDM, Optical, or IP networks. Currently supported protocols include LTE, IMS, UMTS IuCS, UMTS IuPS, VoIP (SIP, SIGTRAN, H.323, MAP, CAP, MGCP, MEGACO), SS7, ISDN, CAS, TRAU and GSM. 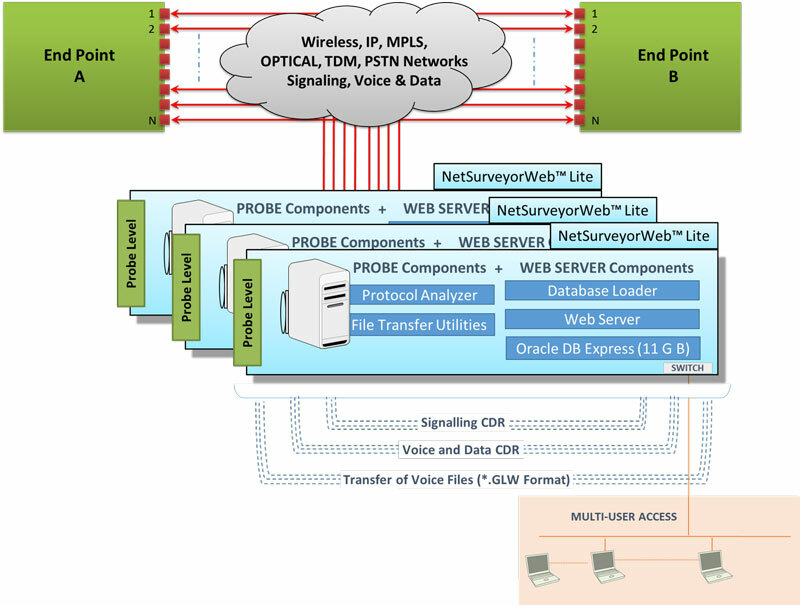 Typically, this requires protocol analysis probes for capturing physical layer, signalling call flows, and voice/data traffic, and a central system comprised of a database engine, web server, and NetSurveyorWeb™ (PKV170), a web-based application, to facilitate data storage and retrieval through web browser clients. 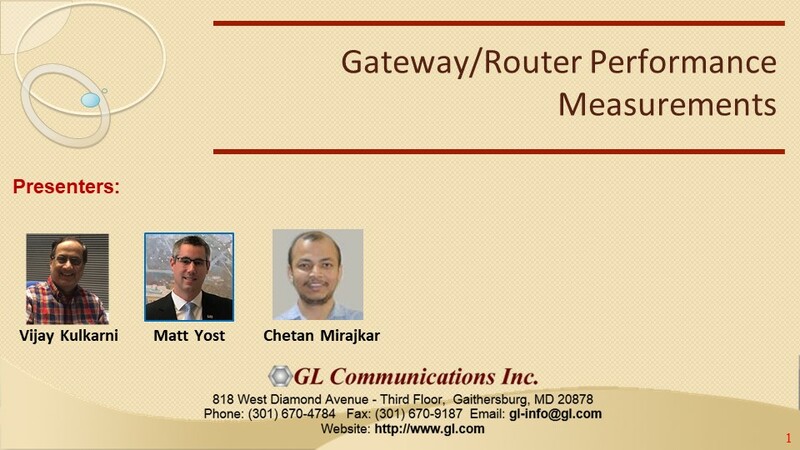 GL also offers NetSurveyorWeb™ Lite (PKV169) a cost effective, Simple Plug & Play connection, which is an integrated and simplified web-based system that is distributed at probe level. Ability to export the call detail records displayed based on time filter or record index as PDF and CSV. Call Detail Records, fraud detection and location, remote protocol analysis and troubleshooting, real-time signaling monitor, traffic optimization engineering, and statistics. Revenue and billing verification, alarm monitoring, intrusive testing. Quality of service measurements, call trace and recording. 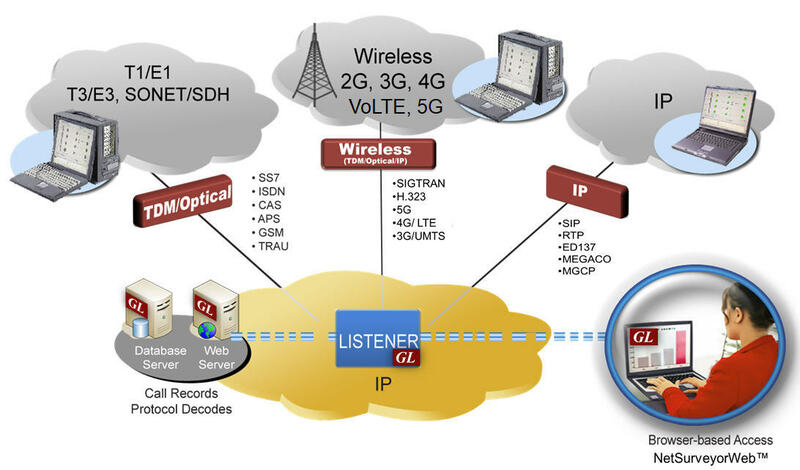 GL's NetSurveyor™ system has a three tier architecture. 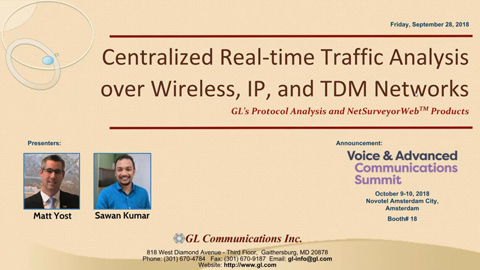 The first layer consists of GL's Protocol Analyzer Probes which are capable of tapping into live call traffic and non-intrusively capture signaling message summary and build CDRs. The second layer is the Database Store Layer where the captured data is stored. The last layer is the Data Access Layer where the data presentation logic is contained. Each of these components are briefly explained below. Probe computers collecting layer 1 (physical layer), layer 2 (data link layer) and layer 3 (network layer) information. Probes can be T1 E1/T3 E3/ OC-3 STM-1/ OC-12 STM-4/IP. Probe computers run protocol analysis applications along with the necessary hardware and software. These probes could be controlled locally using the protocol analyzer application or remotely using GL's Client-Server application. The analyzer hardware for TDM and optical networks can be connected non-intrusively in Monitor or Bridge Modes, or alternatively the data can be looped through the cards. 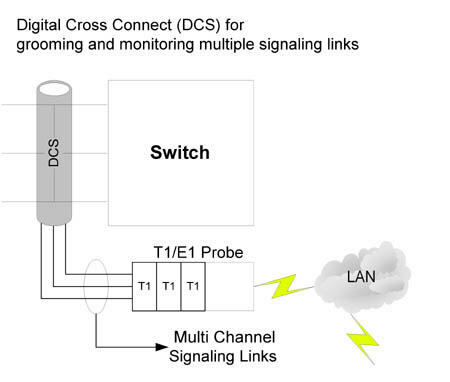 Multiple Link Sets per T1/E1 (through Digital Cross Connect Grooming) - multiple 64 kbps signaling channels per T1/E1 can be monitored simultaneously by grooming through a digital cross-connect - see diagram below. Probes non-intrusively monitor physical lines of the network and forwards call detail records (CDRs), protocol summary, frame data in hex dump, and statistics to a central database. Probes connect via TCP/IP to ODBC compliant real-time database loader. Only precise and filtered data (user selectable) is collected into the centralized database. The PacketScan™ is a feature-robust Windows® based software tool that captures and monitors live IP traffic. In the VoIP world, it can monitor and measure SIP, H323, Megaco, MGCP, T.38 and video calls. In the Wireless network, it can monitor 2G, 3G, and 4G protocols such as GSM, UMTS, GPRS, LTE, SIGTRAN signaling over IP. A number of GL’s PacketScan™ probes and/or,PacketProbes™ are deployed in remote locations across the network to passively monitor VoIP traffic. PC based T1 E1 / T3 E3 / Optical probes collect physical and line level status and performance information. 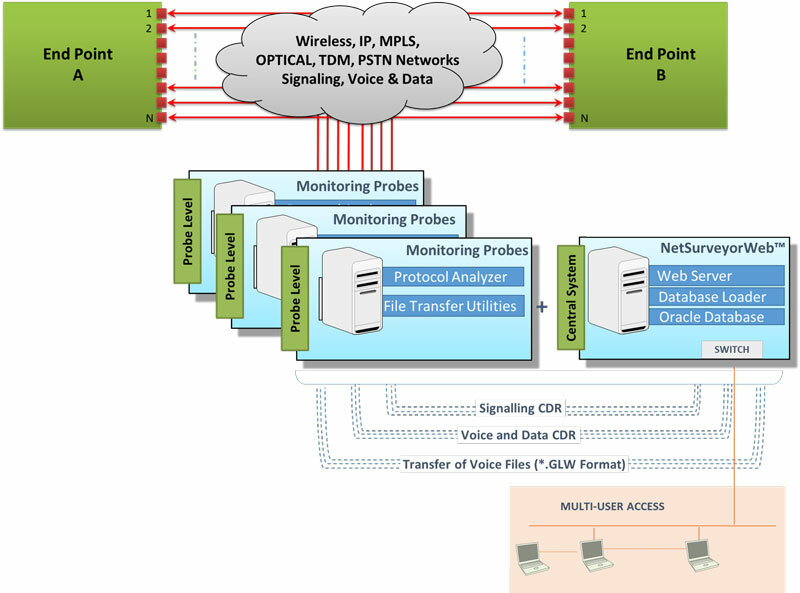 The Intrusive and Non-intrusive "probes" for TDM networks are deployed at strategic locations in a network. They can transmit and collect voice, data, protocol, statistics, and performance information. These probes can relay information to a central / distributed Network Management System (NMS). Database Loader (Data Layer) – A listener application is co-hosted with the database server (SQL DBMS such as Oracle) running on the Data Layer. Interface between the probes and the database is handled by "Listener". The Listener will listen to the streaming data from connected probes, receives data, and feeds the data to DB server. Multiple probes can be connected via TCP to the Database Loader. DB stores the data collected by the probes. Records are stored into a relational database (Oracle) using ODBC connection. Listener is modifiable and supportable with MySQL. 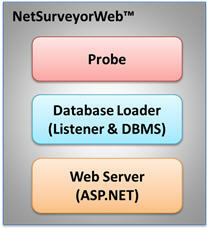 NetSurveyorWeb™ Webserver (Data Access Layer) serves for data mining operations. The database could be accessed in real-time over the web using applications such as GL’s NetSurveyorWeb™, or queried by customer applications such as a billing system or accessed by a reporting tool such as Crystal Reports, for aggregation and analysis of historic data. The NetSurveyorWeb™ is a user-friendly web-based client which accesses the results provided by the centralized DB through a web server. 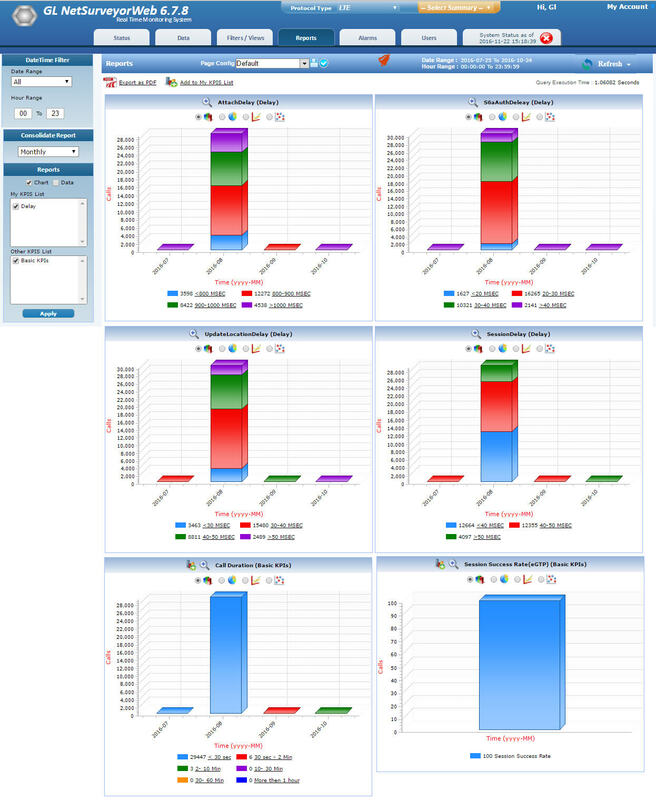 As depicted in the screenshot below, users can log into the central system locally or remotely to view the collected real-time and historic data including call parameters, layer 1 status display, as well as layer 2 and 3 analysis. Also available is the ability to filter the call records using a variety of filtering mechanisms including time/date, signaling and traffic parameters. Access real-time and historic data remotely via browser-based clients. Interfaces with Oracle database for storing real-time and historical data. Web administration features to monitor the connected probe status, database loader status, alarms, and perform database maintenance. Ability to customize column views with sorting capabilities for call detail records. 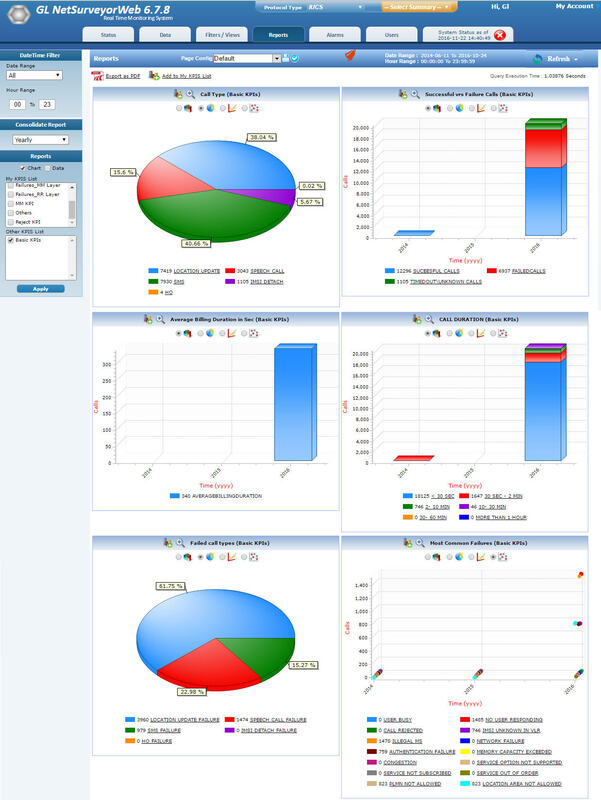 Customize reports and graphs based on SQL queries. 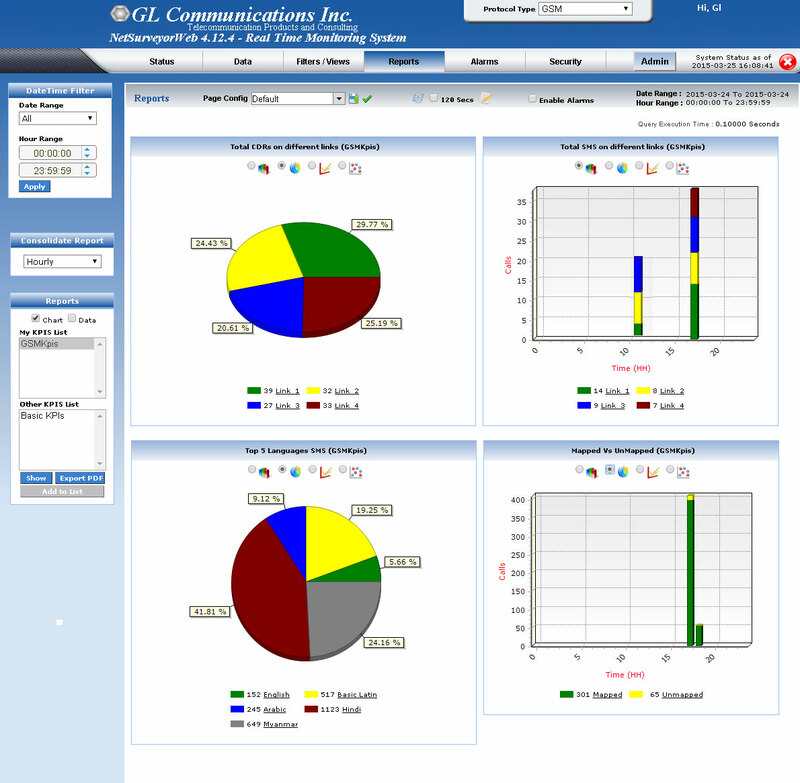 The real-time data view provides visibility into each individual call. Each call can be investigated based on call control, signalling and traffic parameters. Flexible filtering can help organize and identify “Calls of Interest”. The CDR view includes the following. Frame summary view provides summary of signalling data along with the decodes in the form of Hexdump. This option is currently available only for IP calls. Each call can be expanded to reveal per stream RTP statistics. The RTP/audio parameters such as SSRC number, payload type, total packet count, missing / duplicate / reordered / discarded packet count or %, conversational/R-Factor , listening MOS/R-Factor, cumulative packet loss, Max/Min/Average values of Gap, Min/Max/Average values of jitter, Min/Max/Average values of RTD, and average inter arrival jitter are displayed. 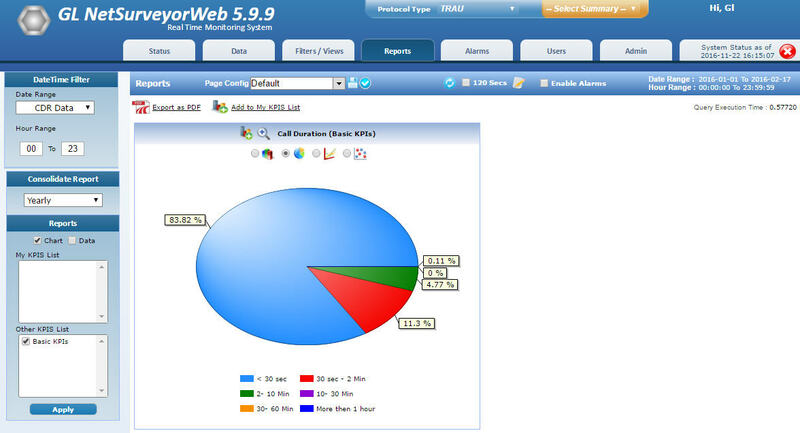 This call flow graph allows easy verification of the messages exchanged and the status of the call. Users can also select any messages and observe the corresponding decode message details in the decode view. This feature display Call Data View, Ladder diagram, and Decode message detail of the selected message in a single view. Also, CDR view provides flexible options to hide the Detail View, Graph View, or Decode View as required in order to view the information properly. Navigate through records easily using Previous and Next Hour, Day, Month, and Year options as required. A particular call of interest can be searched using the Quick Search option. Provides an ability to export current call data records view in PDF as well as CSV file formats. In addition, call data records along with the associated call-flows can also be exported in PDF formats. The call records can be filtered using Date/Time Filter criteria or by defining custom filter profiles. The Date/Time filter displays the call records based on Minutes, Hours, Days, and user-defined date range. The Display All option displays all the available call records. The Custom Filters provide options to filter call records based on various call control, signaling and traffic parameters. Custom filter profiles can be saved and loaded with the click of a button. Single or Multiple Custom filters can be applied to perform deep inspection. Edit & update already existing custom filter profiles. Also provides logical operations to apply between parameters within a filter or multiple filters. Trigger alarms and alerts whenever calls-of-interest occur, a network link failure is detected, or regularly at scheduled intervals. Directly access the pre-configured filter profiles or the KPI profiles to trigger alarms and alerts either when the custom filters conditions are passed, or send the pre-defined KPI report hourly, daily, monthly or yearly. Alert actions can be defined based on the output of the alarm conditions such as like email alert, visual alert, audible alert, SMS alerts, exporting data, setting alarm severity, or even log into tables for future analysis. Alarm Severity type can be set as Minor, Major, or Critical. Flexible options are provided to save alarm filters as profiles, add, edit or delete the existing alarms, selection of user KPIs, and selection of Custom filters. Schedule alarms and alerts for hourly, daily, monthly, or yearly. Email / SMS Alerts: Sends Email alerts for alarms. When the alarm condition set by the user is true then the data will be sent as an Email attachment in the PDF format for the given Email address. In case of SMS, a simple text message will be sent to the registered mobile. Audible Alerts action will beep once for the particular time. 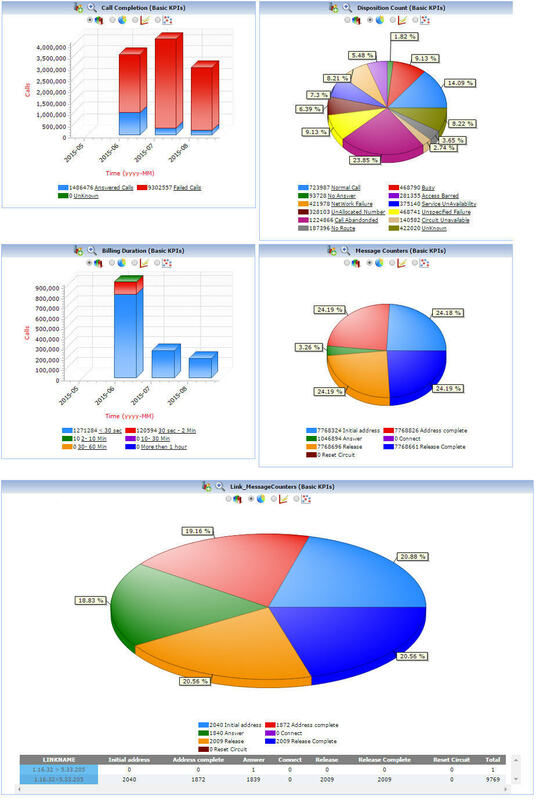 Reports are also available in the form of Bar Graph, Pie Chart, Dot Graph, or tabular format for each of the plotted graph. 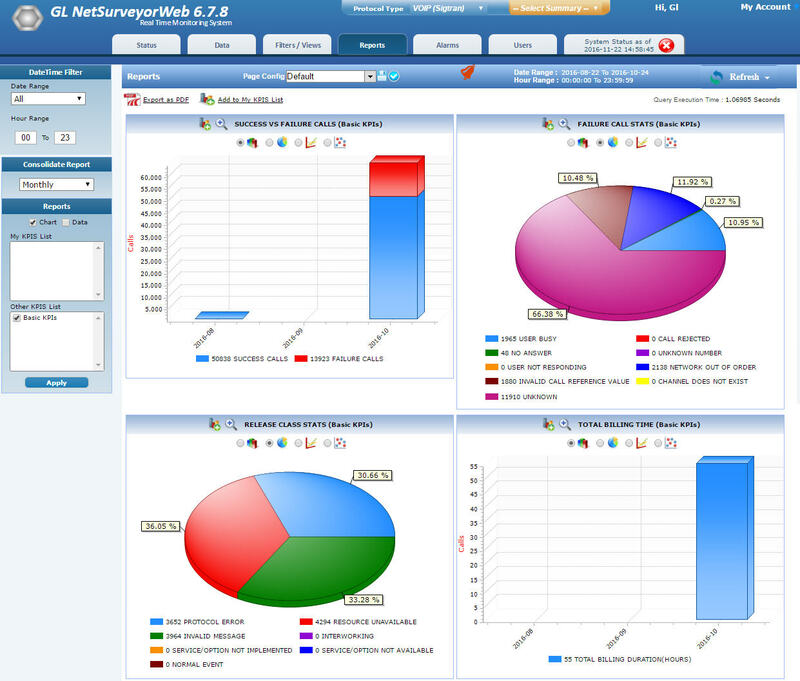 NetSurveyorWeb™ allows users to add new KPIs and customize the reports using Report Configuration feature. 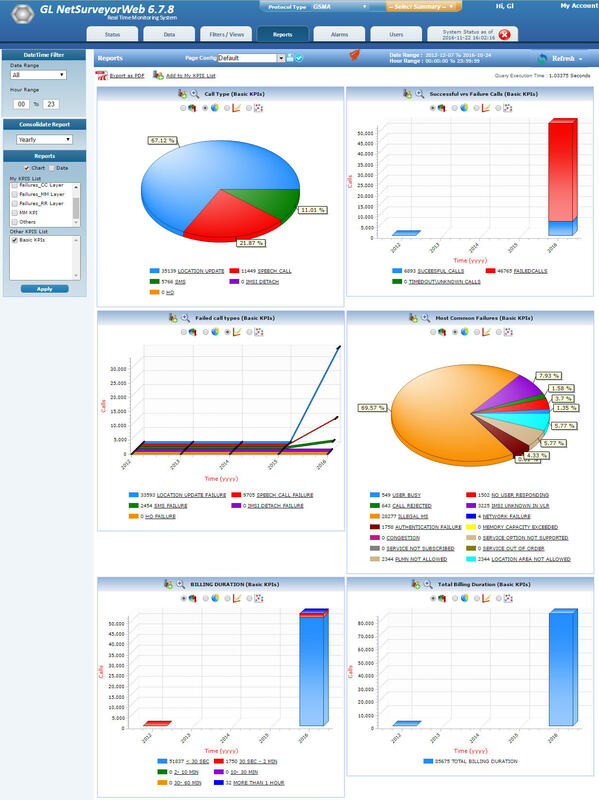 Generates customized reports and graphs based on SQL Queries. 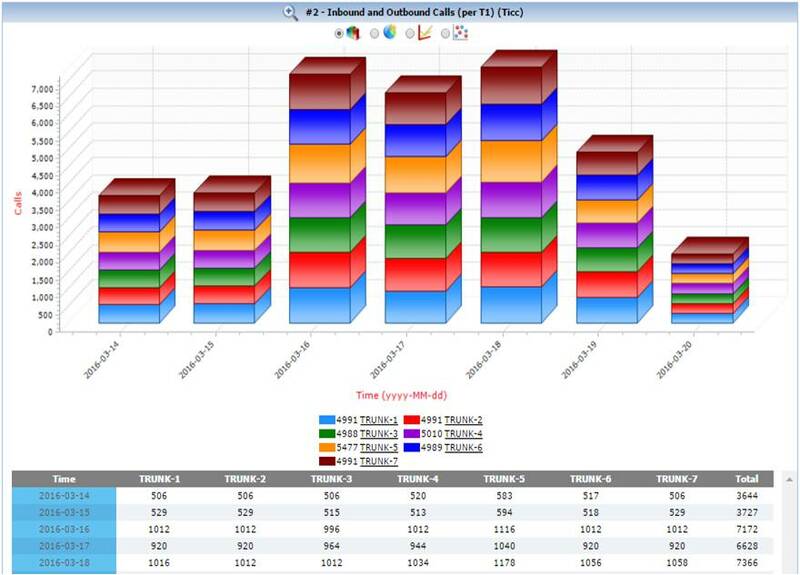 This feature allows user to Add / Import the required KPI to the existing KPI group. This will avoid the user from creating the new KPI as it is readily available. Also, the add option will update the added KPI whenever the user who created this KPI does any modification. The import option will give full permission to the user to edit the KPI as required. GSM (TDM or IP) & TRAU Call Detail Record (CDR) Option for Network Surveillance - requires OLV150 and OLV153 at the central site.